Are you building your new dream home? Do you want to live a Smart Home Life? We can help you with supply and installation of the latest cool tech from voice activated lights to music by the pool. Want to get onboard with this Voice Control stuff you've seen on The Block? Well come visit our stand and go in the draw to win an Alexa! 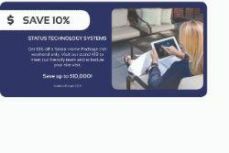 Homeshow special - Get 10% off a Smart Home Package this weekend only. Save up to 10,000!